Call 281-704-3696 today for attic solar fan services in The Woodlands that will improve your energy efficiency. Stop losing energy through your attic and start saving money. You can have instant access to our current online discounts and coupons when you click here. Proper ventilation in your attic is important if you want to reach and maintain a comfortable temperature inside the house. Energy loss through the attic is a major issue in many homes, and improper ventilation is often one of the main culprits. There are several strategies the homeowner can use to increase attic ventilation, and one of the most effective is having an attic solar fan professionally installed. If you’ve been wondering what others in The Woodlands, TX have to say about our range of attic services, click here to read our latest customer reviews! What is an Attic Solar Fan? An attic solar fan is a piece of equipment that’s designed to improve the air circulation in your attic. A quality attic solar fan improves the energy efficiency of your home by drawing hot air and moisture out, preventing mold, saving your roof and saving you money. An attic solar fan runs solely on solar energy, meaning there is no added cost to use one, making it an environmentally friendly choice. Air circulation and venting are crucial factors when it comes to proper attic efficiency. During the heat of summer, your attic can reach temperatures in excess of 160 degrees Fahrenheit. If the attic has proper ventilation, the temperature can be reduced by up to 40 degrees Fahrenheit. Having an effective attic solar fan installed can improve the ventilation and air circulation in your attic drastically, helping your furnace and AC work less and giving you better results for less energy output. It’s important to trust your attic solar fan installation to professionals with experience and proven results in attic efficiency. Proper placement is crucial, and if the installation is performed poorly, it may not produce the benefits you need. 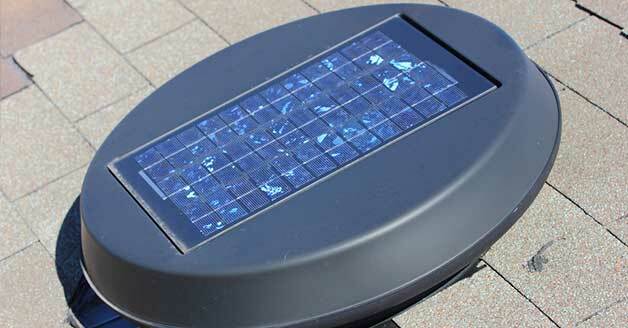 Attic solar fans are effective and efficient fixtures to add to your roof, but high quality installation is the key. Not only do you need the fan to work properly, but you need to comply with building codes and warranties as well. At Affordable American Air Conditioning & Heating we will help you set up an attic solar fan properly so you can enjoy long-term peace of mind. Don’t hesitate to call for an expert solution if you feel your attic is costing you money each year. Schedule an appointment with Affordable American Air Conditioning & Heating by calling 281-704-3696, and we will send a technician to your home in The Woodlands, TX to get the process started.